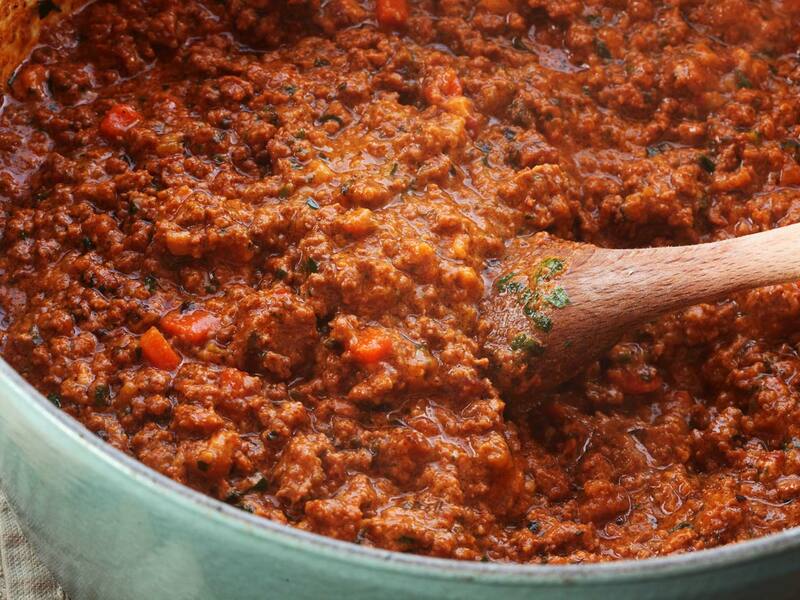 Slow cooking this bolognese sauce for hours to give it that rich, delicious flavor. Make a large batch and freeze it for quick weeknight pasta dinners. In a large heavy pot, heat the olive oil over medium heat. Add the onions, celery, and carrots and allow to cook for 8-10 minutes or until the onions are translucent. Drain all but about 2 tablespoons of the grease. Add the garlic and tomato paste. Raise the heat to medium-high, add the ground beef, 1 teaspoon of salt, 1/2 teaspoon of pepper, the Italian seasoning, and the red pepper flakes. Allow the meat to brown, add the apple cider vinegar and allow to cook for another 3-4 minutes. Add the meat mixture to the crockpot along with the diced tomatoes, canned tomatos, bay leaves, parmesan, and parsley. Add a big pinch of salt and pepper, and allow the bolognese to cook for 8 hours on the LOW setting of your crockpot. Add the half and half and adjust salt and pepper to taste. Serve over pasta sprinkled with parmesan cheese and additional parsley. Tomatoes* – If you don’t want to use fresh tomatoes, use an additional 28 ounce can of whole tomatoes. This is less than the 2 1/2 pounds, but the flavor is also more concentrated. For the Ground Beef – Don’t want to choose something that’s too lean as it will dry out quite a bit in the long cooking process. The amount of meat to use is adjustable. Some like a more meaty sauce, other prefer little or none. If you do wish to use an alternate like TVP or shredded eggplant or cauliflower, put them in near the end of cooking time. If you cook them the whole time they will just become mushy. Leftover bolognese can be frozen in ziptop bags and can be thawed and reheated for serving.